Last month, the Italian Village Society and Short North Civic Association formed the Short North Block Watch. This new community engagement resource allows Short North area residents to share information, foster collaboration, and promote safety. 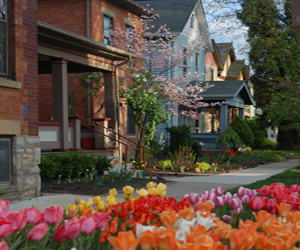 Participating neighborhoods include Italian Village, Victorian Village, Harrison West, Dennison Place, The Circles, and the High Street Business District. On October 18, the “Italian Village Block Watch” Facebook profile converted to a “Short North Block Watch” page and shortnorthblockwatch.org went live. The Facebook page serves as the program’s master hub, while the website lets people register for email alerts, search and file crime reports, access crime prevention tips, and send messages. Each Short North neighborhood has a designated block watch coordinator and email address. This framework enables neighborhoods to easily share information across boundary lines and to be recognized as a larger entity. Neighborhood block watch coordinators will operate their own programs as they fit, and will be encouraged to post updates related to street sweepings, street light surveys, and other area projects. To sign up for email alerts, go to www.shortnorthblockwatch.org. To see what’s been going on or to communicate with other participants, go to www.facebook.com/theshortnorthblockwatch. You can also contact the Harrison West coordinator at harrisonwest@shortnorthblockwatch.org. The main program coordinator can be reached at info@shortnorthblockwatch.org.